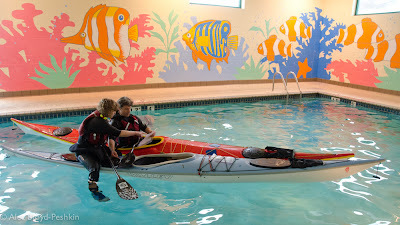 Comparing notes before the start of our pool session. 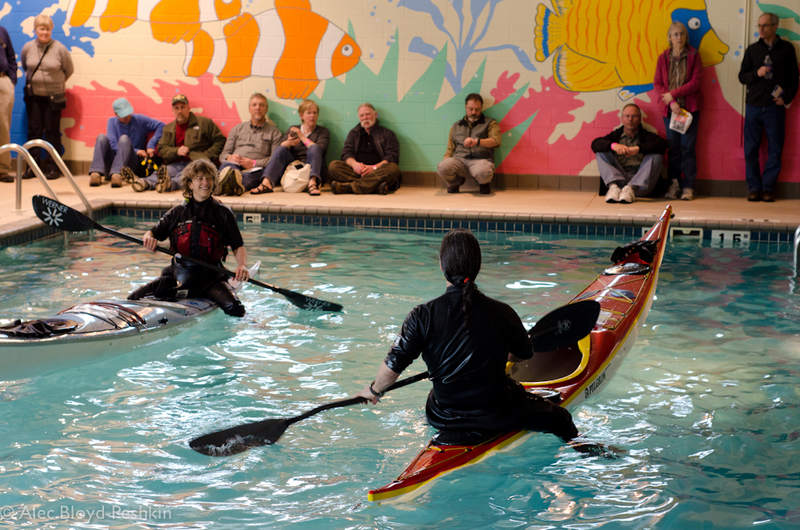 Our pool presentation at Canoecopia 2013 was on the kayak self-rescue known as the scramble. Our goal was to show the rescue, explain how to do it effectively and efficiently, answer questions from people who've found it difficult to execute, and have fun in the process. 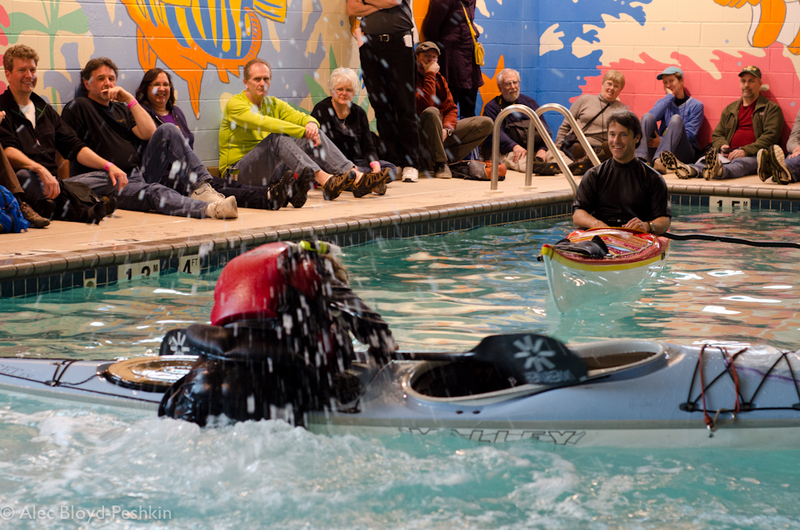 Warming up by playing on our boats as people came in and found places to sit and stand. To address these, we shared strategies that work for paddlers who are larger or less agile than we are. We also demonstrated that with good technique, this rescue works even if you have long legs or a very large chest. Sharon getting up on the back deck wearing two PFDs. Back on the boat in spite of the extra large chest. We shared several games that help develop the skills this rescue requires. Judging by the smiles on faces all around us, we weren't the only ones enjoying ourselves. It's helpful to have a strict time limit. With only 20 minutes per pool session, we had to focus on the essentials and make every minute count. We're hopeful that with practice and good coaching, those who came to our presentation will be more successful with their future self-rescues. 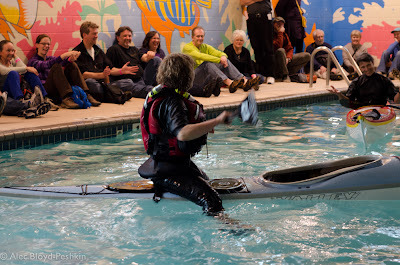 Thanks to Keith Wikle and Aaron Litchfield for taking photos while we were on the water. Came across your blog through a Paddling Planet link, and liked the scramble post enough to wonder who you guys are. So I look, and I can't find one hint. Do you want to be anonymous, or are you just coy? Hi, Rhogan! Thanks for the compliment and for noticing that our "about us" tab fell off our blog! I want to learn as well, Looks really fun..